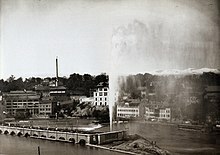 The first jet d'eau, around 1886. The Jet d'Eau (French pronunciation: ​[ʒɛ do], Water-Jet) is a large fountain in Geneva, Switzerland. The fountain is one of the city's most famous landmarks, and one of the largest fountains in the world. It is located at the point where Lake Geneva empties into the Rhône river. ↑ "Jet d'eau, Geneva". Europe for Visitors. Retrieved 4 September 2015. This page was last changed on 5 September 2015, at 08:44.